After seven years of research, corresponding with fellow collectors and collecting photos, and a LOT of work, the author has just completed his next pictorial history. 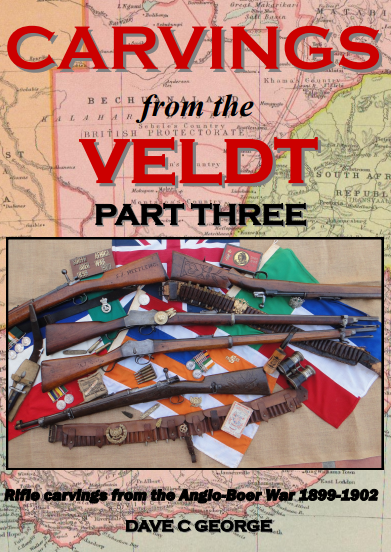 This book will be another 345 page pictorial history that is packed with a further 338 more fascinating Boer War weapons that feature some form of 'stock art'. These include rifles, carbines and handguns - all with names, initials or decorations carved or engraved onto the stocks (such as the ZAR and OVS coat of arms). There are more amazing stories and service histories of Boers and soldiers. There is also a large variety of unit badges, along with swords, bayonets, bandoliers and ammunition. An updated list of M95 Mauser serial numbers is also featured, which illustrates just how many of these Boer rifles were named. The new book is available in both Hard and Card cover. (Stocks of Books have arrived - now available for posting to customers). The first 100 copies of the Hard Cover books will be a 'Limited edition' and will be numbered (hard Cover only). Please contact author and I will advise air and sea postage prices (it will be a big saving if you can arrange with friends to post 2 or more books in one parcel). Either per direct bank deposit, or via paypal. If using paypal, please ADD the 3% paypal fee (all in Australian Dollars) . Please direct orders direct to author. And if you wish to buy a book and pay via PayPal, please contact the author (see "CONTACT US" Tab at top of the page). Copyright © 2004 Dave George. All Rights Reserved.